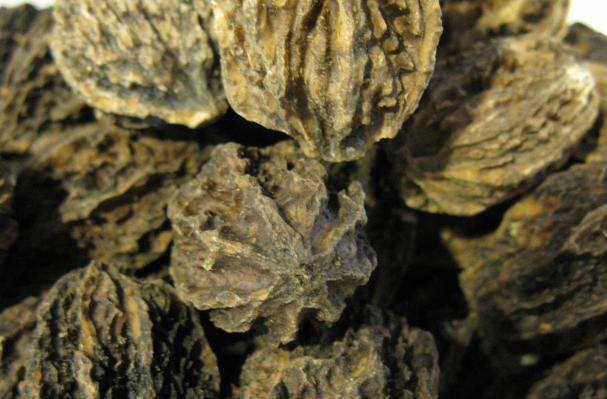 The tasty, oily, and nutritious interior of the seed from either of three species; Juglans regia (English walnut), Juglans nigra (the smaller, more flavorful, but thicker shelled black walnut), or Juglans cinerea (fruit of the butternut tree, also known as white walnut tree), native to North America. Choosing: Look for walnuts whose shell doesn't have holes or cracks. Shelled walnut should not be shriveled but must look plump and crisp. Procuring: After a walnut sapling is planted, it takes five to seven years for it to grow into an adult tree suitable for harvesting. Shelled walnuts can be opened with a nut cracker. They can be eaten raw or lightly roasted. It goes great as a snack or topping for pastries, desserts, or salads. One can lessen the bitter taste of walnuts by blanching them for a minute or two, than draining and them in a medium warm oven. You can also lightly roast the walnuts then rub off the skins. Cleaning: Walnuts grow in a hard shell that keeps them safe and clean. Once the hard, outer shell is removed, no additional cleaning is necessary. Keep shelled walnuts tightly sealed and store refrigerated for up to 6 months or in your freezer for up to one year. In-shell walnuts will remain fresh for several months when stored in a cool, dry place. Do not shell until ready to use. Walnuts are a good source of beneficial Omega 3 fats and antioxidants, which makes them a highly valued dietary ingredient. Walnuts are a great snack food. History: Walnuts are the oldest tree food known to man, dating back to 7000 B.C. The Romans called walnuts Juglans regia, “Jupiter’s royal acorn.” Early history indicates that English walnuts came from ancient Persia, where they were reserved for royalty. Thus, the walnut is often known as the “Persian Walnut.” Walnuts were traded along the Silk Road route between Asia and the Middle East. Caravans carried walnuts to far off lands and eventually through sea trade, spreading the popularity of the walnut around the world. English merchant marines transported the product for trade to ports around the world and they became known as “English Walnuts.” England, in fact, never grew walnuts commercially. The outer shell provided a natural protective layer helping to maintain the quality of the nut.